I'll be the first to admit, this outfit shows off more skin than is typical for me, and for a second I thought about pairing these shorts with a different top that offered some more coverage but I couldn't resist wearing these shorts with the matching crop top. The scalloped lace was too pretty and the blue color is stunning for summer time. The best part about matching sets though is the endless styling options!! I wore these shorts again over the weekend with a white tank and flat slide sandals and can picture this crop top looking great paired with a high waist midi/maxi skirt! Mixing and matching these pieces is all part of the fun of a coordinating set. 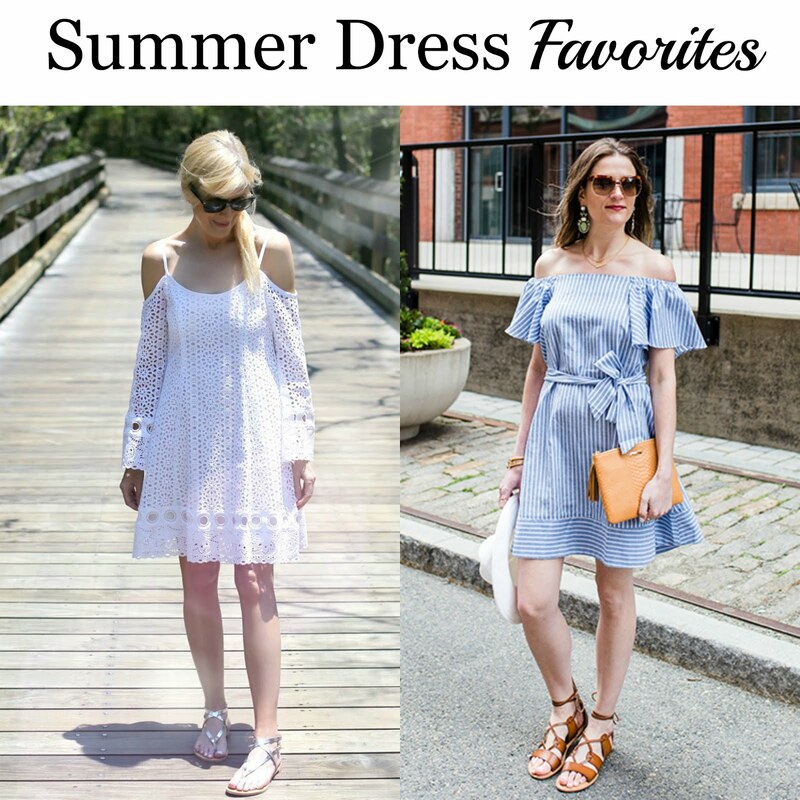 Last week, we loved the way Mary from Mary Murnane and Rachael from Threads for Thomas styled their summer dresses. You look gorgeous!! I absolutely love this set!! That color looks amazing on you! Girl, crop tops were made for you! I love this set. The white is so perfect for summer. Thanks girl! It's actually light blue which makes me love it extra! Thanks so much for the feature, totally made my morning! You are killing it in this two-piece set... I love the bright color. So cute! So glad. Your dress from last week was stunning! This is so summer cute, and I'm in love with the color!! Michelle---this is perfect. I don't consider this too much skin (depending where you're going, of course), but you're young, and beautiful and the set fits wonderfully! It's not showing anything inappropriate and you look great!! Of course, you could wear a white tank under the shirt to hide your midrift if for the occasion it was needed...but this rocks! As for the matching sets....the older generations used to live and die by them---so, of course, I think of them as ugh---this one however is very young & vibrant, so maybe I'll get on the bandwagon! Thank you so much Jodie! I'm not one to shy away from skin, but this is a little bit more than I usually show on a daily basis! LOVE this look on you! You look too cute! It's light blue! Isn't it lovely?! And just when I think you cannot get anymore adorable.....LOVE THIS SET on you!! You look fabulous in this matching set! You tiny thing you...so adorable! The details on this matching set are gorgeous! I love this color and those sandals are amazing. Beautiful look Michelle! Coordinates are my favorite. I rocked a bunch last summer! You look fantastic in your matching set. Your style is on fire! They are the best! SO many ways to mix & match the pieces. How amazing you look beautiful!! Love the light and airy look of this matching lace set! Thank you for hosting the link up, hope you can stop by my first Linkup this Wednesday! I adore this matching set! You are rocking the lace! Michelle outfit is nice but i say you are Queen of smile. awesome smile you have. Maria, your comment just made my day! So sweet of you! This two piece set is so pretty and looks amazing on you! I'm in love with the white lace. Thank you for the feature! It's light blue! I loved the color & am sad it didn't photograph as well as I had hoped! Pretty none the less! The lace set is so pretty, you look lovely! 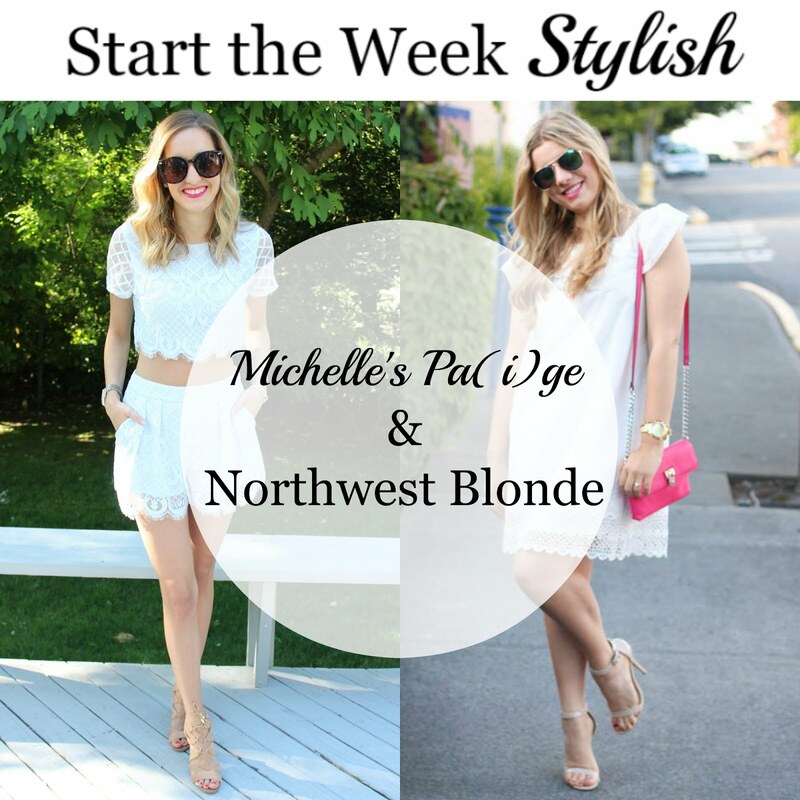 This lace set is just lovely on you, Michelle! So perfect for summer! You are so sweet! So glad you found some inspiration from this look!